These Sonoma County development and design guidelines protect the visual integrity of Sonoma, Taylor, and Mayacamas Mountains. They were drafted and proposed to the Sonoma County Board of Supervisors by SMP. Sec. 26-90-120 (revised 11/2014) provides property owners with clear information on requirements for height and color of buildings, landscaping, exterior lighting and other elements of visibility that may affect the natural integrity of the mountain. 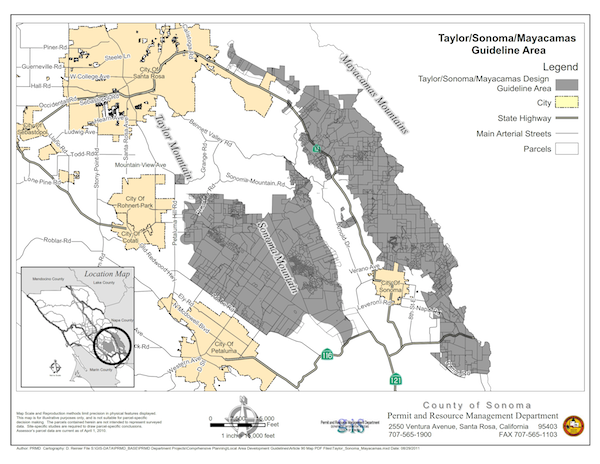 Sonoma County Permit and Resource Management Department (PRMD) manages compliance. Sec. 26-90-120. – Taylor/Sonoma/Mayacamas Mountains (MTN). (a) Purpose. These standards are intended to reduce the visual impacts of residential related development within the Scenic Landscape Units of Taylor, Sonoma, and Mayacamas Mountain areas as visible from public roads. (1) Deed Restriction. A deed restriction shall be recorded stating the conditions of the Design Review or Administrative Design Review approval. (2) Structures and Site Development. These standards apply to single-family dwellings, second dwelling units, residential accessory structures, and other associated site development including but not limited to roadways, site grading, and utilities (collectively referred to in this Section as “site development”), except as otherwise exempt, that are or would be visible from public roads. (3) Board Appointed Citizen Advisory Committee Referral. These standards shall be utilized by the Department and applicable Board appointed local citizen’s advisory committees in compliance with Chapter 26, Article 64 (Scenic Resources Combining Zone) to evaluate any Building Permit applications for proposed single-family dwellings, second dwelling units, and any other associated site development. (4) Effect on Existing Structures. Legal single-family dwelling(s) or appurtenant structure(s) existing on the effective date of this Section shall be deemed to comply with this Section. Expansions to existing single-family dwelling(s) and/or appurtenant structure(s) shall be required to comply with this Section. d. Structure(s) that are not or would not be visible at the time of construction from public roads. Nothing in this section shall apply to the appearance of a single-family dwelling(s) or appurtenant structure(s) where viewed from a non-vehicular pedestrian, bicycle, or equestrian trail open to the public. b. The proposed development will not conflict with Chapter 26, Article 64 (Scenic Resources Combining Zone). a. Applicability. The provisions of this subsection apply to all proposed site development which, for the purposes of this Subsection includes each proposed dwelling, appurtenant structure, and any related utility line, access road, and driveway except on a site where a building envelope was previously established by way of a recorded subdivision map or recorded open space or conservation easement, in which case the structure shall be located within the established building envelope. b. Siting Criteria. All features of site development that are subject to these standards shall, to the extent feasible, be located to be substantially screened when viewed from public roads. The term “viewed” shall mean what is visible to a person of normal eyesight from public roads. c. Alternative Siting. The location of site development in compliance with this Section shall be feasible based on the factors of fire, safety, on-site sewage disposal, drainage, geologic, and other constraints. Where these constraints make it infeasible to substantially screen the structures and related site development, they shall be located in the least visible location on the parcel and shall be subject to the architectural and landscaping standards in specified in subsections e. and f., below. d. Use of existing vegetation and site features. 1. Existing vegetation or existing topographic features shall be used, where feasible, to substantially screen site development as seen from public roads. 2. Grading and removal of trees and other mature vegetation should be minimized. Avoid removal of specimen trees, tree groupings, and windbreaks. 3. The applicant shall provide the Department with a site plan indicating if any vegetation is proposed, or topographic features proposed to be removed as well as vegetation to be retained and used to substantially screen the site development. 4. Where existing topography and vegetation would not screen structures from view from public roads, landscaping shall be installed consisting of native vegetation in natural groupings that fit with the character of the area in order to substantially screen structures from view. e. Ridge-line Development. On hills and ridges, no portion of a single-family dwelling, appurtenant structure(s), or any portion of a structure shall appear against the sky when viewed from public roads. f. Roads and Driveways. The grade and alignment of each new access road, including any driveway, related to the construction of any single-family dwelling and/or appurtenant structure(s) shall be located and designed to minimize the visibility of each road and road cut, as viewed from public roads. 1. All exposed slopes and disturbed soil resulting from site development shall be graded so as to be gently sloping and blend with the natural topography. 2. Regraded slopes and disturbed soils shall be revegetated with indigenous plants, or other plants with similar massing and coverage characteristics suitable to minimize soil erosion. (2) Architectural Standards. Each single-family dwelling and appurtenant structures, including fences, shall comply with the following standards, except as may be exempted in compliance with subsection (b)(5) (Exempt Structures), above. 1 All new structures shall be designed to respect the rural character of the surrounding environment. 2. The architectural form of the structure(s) and site development shall utilize appropriate form and massing to reduce the visual impact and blend with the environmental setting. b. Building Materials and Exterior Colors. 1. The exterior colors of the structure shall be local earth tones blending with the natural environment of the site and have a low reflectivity value. 2. An exterior color may be changed to another new color, provided that the new color is consistent with these standards. 3. Building materials (e.g., bricks, natural wood, or stone) may be considered, provided the material used is an appropriate color and has a low reflectivity value. c. Windows. Window glazing shall be nonreflective. 1. Exterior lighting shall be downward facing, fully shielded, and located at the lowest possible point to the ground to prevent glare and light pollution. 2. Light fixtures shall not be located at the periphery of the property and shall not spill over onto adjacent properties or into the night sky. 3. Luminaires shall have a maximum output of 1000 lumens per fixture. 4. Total illuminance beyond the property line created by simultaneous operation of all exterior lighting shall not exceed 1.0 lux. 5. All roadway, parking, and driveway lights shall be low profile utilizing full cut-off fixtures. 6. Flood lights are not allowed. 7. If security lighting is necessary, it shall be motion-sensor activated only. (3) Landscaping. Site development in compliance with this section shall require landscaping as follows, consistent with Section 7D-3 (Water Efficient Landscape Regulations), County Code Chapter 13 (Fire Safety Ordinance), and Emergency Services Department Vegetation Management Guidelines, except as provided by Subsection (c)(3)c., below. a. Size and Density of Plant Materials. Landscaping necessary to accomplish substantial screening shall be of sufficient size and density to screen the structure within ten (10) years following installation. b. Plant Species. Plant species used for any screening and revegetation required by these standards shall be indigenous, or of a similar character as determined by the review authority. Planting shall also comply with the fire safe standards. 2. Proposed an alternative or demonstrated that landscaping is not necessary and/or feasible for the particular structure and/or site development at issue. (d) Boundaries. The standards of this Section apply to all properties within the boundary shown in the Zoning Database as being within the LG/MTN (Local Guidelines/Taylor Sonoma Mayacamas Mountains) combining zone.